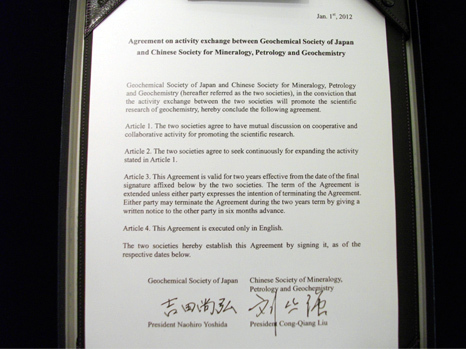 We are pleased to announce that the MOU between the Geochemical Society of Japan and Chinese Society for Mineralogy, Petrology and Geochemistry for scientific exchange, which had been approved during last year's General Assembly, was signed at a signing ceremony in Beijing on 16 July 2012. The signing ceremony was a stately yet friendly occasion as pictured. From GSJ, former President Prof. Ebihara, Prof. Zhang from Toyama University, and the President, myself attended. From Chinese Society for Mineralogy, Petrology and Geochemistry, the President, Prof. Liu attended along with a dozen executive Society members. Although the ceremony took place in July due to scheduling, the signatures were made retroactively for 1 January 2012. 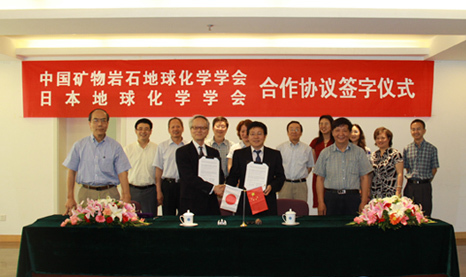 After the signing ceremony, both parties participated in the introduction of both Societies and histories leading up to this MOU, as well as the discussion of the future plan for the scientific exchange. The discussion included the constructive exchange on the GC2016 and future cooperative relationship. The MOU is fundamental and broad. We would like to encourage our Society members to take advantage of the MOU to further expand mutual scientific exchange activities.